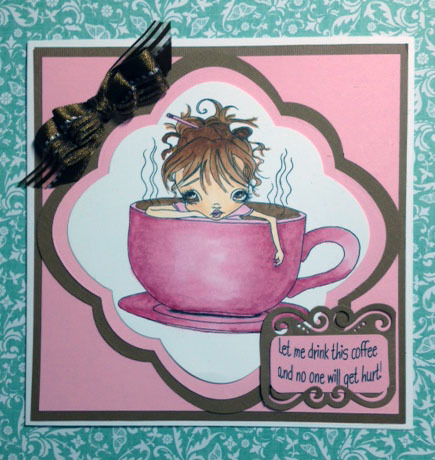 This card is for the Brown Sugar Challenge # 151 and the cute digi is from Odd Ball Art and is named Frazzled Monday Morning Big Eye Girl. There are so many to choose from that what the heck, just buy them all... (I wish). Just to tell a little about my card I used paper from my scraps..... yayyyy, but I still have a pile a mile high. And of course the digi and sentiment are from Odd Ball Art. Added a little bow and that's my easy peasy card for this challenge. I hope you like it and now why not join us for some fun and maybe you will be our next winner at Brown Sugar Challenge. Oh, by the way it is a Monochromatic Challenge, more fun!! Thanks so much for stopping buy and you are allowed :) to leave a comment! Absolutely loving the frazzled girl and I can also totally relate. Dont appear from the bedroom without coffee in the morning. Pink and brown is always a winning combination. super cute card, I am a morning bug as soon as my feet hit the ground...wide open...lol....but I still luv that first cup of joe!